MOSCOW, October 28 (RIA Novosti) - Russian Prime Minister Vladimir Putin proposed on Tuesday that Russia and China gradually switch over to national currency payments in bilateral trade, expected to total $50 billion in 2008. "We should consider improving the payment system for bilateral trade, including by gradually adopting a broader use of national currencies," Putin told a bilateral economic forum. He admitted the task would be tough, but said it was necessary amid the current problems with the dollar-based global economy. Chinese Prime Minister Wen Jiabao described strengthening bilateral relations as "strategic." "Mutual investment by Russia and China has already exceeded $2 billion, this is a very good index," Jiabao said. He praised the success of numerous projects, including additional construction of China's Tianwan nuclear power plant and the opening of a joint pharmaceuticals center in Moscow. A number of large Russian companies, including state-run oil producer Rosneft and aluminum champion RusAl, are seeking to develop investment projects in China, Jiabao said. The Chinese premier said bilateral cooperation in the helicopter industry, mechanical engineering, the energy sector, timber production and innovation sector was also showing signs of progress. "China is a staunch supporter of Russia's accession to the WTO, but is categorically against politicizing the issue," Jiabao said. The Russian premier invited Chinese investors to join Russian timber projects. 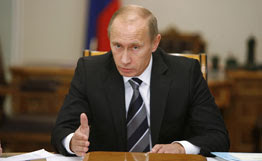 "We welcome both domestic and foreign investment in Russia's timber sector," Putin said. "As one of the largest consumers of our products, China could be a source of such investment." He also offered Beijing Russia's assistance in developing a large passenger plane on the basis of Russia's experience with its wide-bodied Il-96 aircraft.